The Depart of Justice issues a report on vaccine injuries and deaths every quarter to the Advisory Commission on Childhood Vaccines. 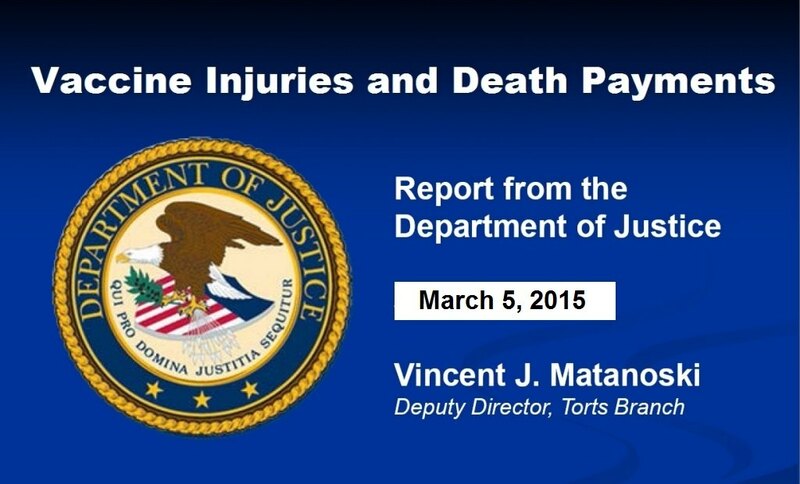 The March 5, 2015 report states that there were 117 cases for vaccine injuries and deaths compensated from 11/16/2014 to 2/15/2015. Five of those settlements were for deaths linked to vaccines, with three deaths related to the flu shot. The unified message presented by the U.S. mainstream media and certain government agencies is that vaccines are safe. This is a lie. Vaccines are dangerous. People are injured and killed by vaccines, and the quarterly reports from the DOJ, which probably reflects a very small percentage of the actual cases, clearly reflect that inherent danger. class actions state by state? Vaccine Safety The National Childhood Vaccine Injury Act of 1986 §300aa–23. Trial punitive damages 2) If in such an action the manufacturer shows that it complied, in all material respects, with all requirements under the Federal Food, Drug, and Cosmetic Act [21 U.S.C. 301 et seq.] and this chapter applicable to the vaccine and related to the vaccine injury or death with respect to which the action was brought, the manufacturer shall not be held liable for punitive damages unless the manufacturer engaged in— (A) fraud or intentional and wrongful withholding of information from the Secretary during any phase of a proceeding for approval of the vaccine under section 262 of this title, (B) intentional and wrongful withholding of information relating to the safety or efficacy of the vaccine after its approval, or (C) other criminal or illegal activity relating to the safety and effectiveness of vaccines, which activity related to the vaccine-related injury or death for which the civil action was brought. Do you really think our government is going to willingly release any kind of data that will potentially loose them millions of dollars in lost revenue (taxes) that generates billions of dollars to the economy world wide? That would have to be done by a whistle-blower and we all know how those people are treated!! This government makes its decisions based on greed…certainly not the well being of its citizens!! Thank you for posting the government data. Very important for folks to get educated. We may disagree as to the risk and whether there is intent to deceive but education is a great place to start. Vote if you are in Canada to create a vaccine compensation program we have NO JUSTICE in our country re this .Bob Martin READ: Focus Magazine on line Feb, issue P.16,17 AND VOTE PLEASE . Where is a link to the actual government data? Not that I don't trust this data but it carries more weight when it comes from the horse's mouth.